Are you a DIY traveler? Do you enjoy last minute getaways, weekend breaks, or other short trips? Then the Virtuoso self-booking tool is for you! When you check in, you’re a VIP with the hotel simply because you’ve booked with Ourisman Travel. You can get the instant gratification from booking online and you’ll be an instant VIP. This tool gives you Virtuoso access in a click of a button, on your time, where you can receive instant VIP amenities and upgrades on your own. The Virtuoso Booking Tool gives you the ease and convenience of online booking – plus the value and VIP treatment we know you love. All you have to do is sign on and identify Ourisman Travel as your Virtuoso Advisor. If you see rates, but are not able to book online, double check that you’ve selected us, Ourisman Travel, as your advisor. Follow the easy instructions in the booking tool. Enter your dates to view rates and availability, select the room you want, provide your contact and payment details, and voila! You’ve made your booking. Please note we do not recommend this tool if you are booking multiple rooms, looking for connecting room options, or have multiple destinations/hotels in a larger/longer trip. Step #3: Travel like a VIP! Once you make a booking, we get an alert, and we will follow up with you and the hotel as a part of our usual VIP hotel booking process. Your check-in experience will be the same as it ever was and you will receive all the usual recognitions for booking with Virtuoso and Ourisman Travel. 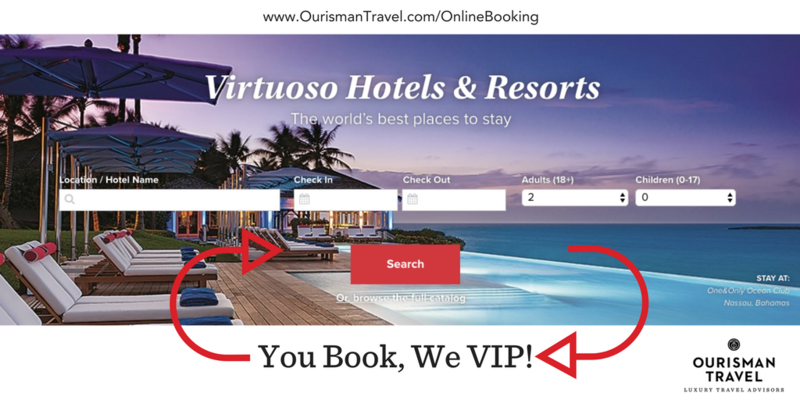 We received a lot of positive feedback from our blog post on how to Get Extra Perks and Avoid Fees when booking with Ourisman Travel, and are very excited to share our “Pro-Tips” for the new Virtuoso.com Booking Tool! If you are a self-proclaimed “RTB Traveler” (ready-to-book) we guarantee you are going to love this tool! Easy Trouble-shooting: If you are having issues booking, first make sure you have created an account and are signed in. If you don’t have an account, the site will prompt you to “contact your advisor” and won’t allow you to make a booking. You can’t make bookings in a mobile browser: The Virtuoso Booking Tool is not mobile friendly and won’t allow you to book if you are using a phone or iPad. In order to successfully book through the tool, you must book from a desktop computer/laptop. Not all hotels are participating - You will see that not all hotels are participating in the program and many will direct you to contact your advisor to request a booking. In those cases you can use the web form on Virtuoso.com or submit a travel request form to us and we'll get you squared away. If you see rates, but are not able to book online, follow our trouble-shooting advice in the first point above. Book any time, any day! – Quite possibly, the best benefit of this tool is that it operates 24/7. While we would love to be available to you 24/7, we do have to sleep! If you are worried about availability or a rate change, this booking tool will allow you to lock your trip in then and there – even if it’s 3 am on a Saturday night! Promotions - Keep in mind that not all promotions are created equal! Some promotions will not combine with Virtuoso rates, so you may not see all of them available when searching rates. If you have your eye on a special promotion, feel free to reach out to us to look into it. To view nightly rates: Use the “View Total" dropdown option to view nightly rates, taxes and total (without leaving the hotel page). This is especially helpful when you’re booking a free night promotion. Currencies: Rates will likely default to your local currency (not the hotel’s). While this enhances convenience for you, keep this in mind when booking foreign hotels. Even though USD pricing may be displayed you will actually be charged in the hotel’s local currency.Last Minute Bookings – There are two things to keep in mind if you are booking a last minute (anywhere from 7 days prior to travel, to time of arrival). If you book via Virtuoso.com, our last minute fee will not apply. This fee is to cover our team’s time for prioritizing last minute rate inquiries; which of course does not occur if you are booking directly through Virtuoso.com. Please note: The booking tool does not allow for bookings made within 24 hours of travel. While we will do our best to follow our typical VIP process of contacting the hotel directly for any booking; we cannot guarantee this process for last minute bookings through Virtuoso.com. Regardless, you will still receive Virtuoso amenities. You cannot cancel or change a booking via the Virtuoso Booking Tool: please contact us directly if you need to change or cancel your booking. Enter all travelers’ information: Don’t forget to add your guests to the reservation as well so we can be sure we have the full picture of your trip. Some programs will trump Virtuoso – As you may know, we are fortunate enough to work with many exclusive luxury hotel programs in addition to Virtuoso. While it’s rare, there are a few programs that we will recommend over Virtuoso. In these instances, we recommend you still request your trip through us to get the best value. When your hotel booking is not simple – The booking tool is not designed for multiple rooms, special requests, trips involving multiple hotels, or any other "booking complications." Anytime you have a booking request that goes beyond the most basic hotel reservation, it is still best to contact us first! And of course, this doesn’t change any of the services we already offer! We’re still available to book hotels and take care of your other travel needs. Whether designing a complete, personalized itinerary, or simply securing a hotel-only accommodation, we want to provide you a way to become and stay a part of the Ourisman Travel family! Enjoy the online booking tool, and we hope to see your Virtuoso.com reservation in our inbox soon! This entry was posted in Travel Industry and Ourisman Travel and tagged Hotel, protips, Virtuoso. Bookmark the permalink.